The seven stained glass windows were also designed by Father Marko Rupnik and were made by Vetrate Giuliani in Rome. According to the account of creation in Genesis 1, “God said ‘Let there be light’ and there was light” (v. 3). Light, therefore, is created by God’s word. That is why the light comes into the Chapel through the windows that are inscribed with words. The words are not immediately obvious: they need to be searched out, discerned, meditated, ruminated. 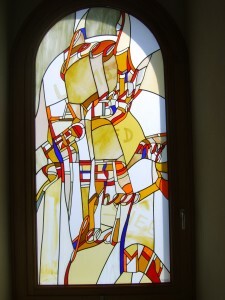 Each window contains a phrase associated with the particular person depicted. Moving anti-clockwise from the top left, they are: Christ (“Feed my lambs, feed my sheep”); Our Lady (“Do whatever he tells you”); Saint Patrick (“Ut Cristiani ita et Romani sitis” tr. “Be ye Christians as the Romans are”); Saint Oliver Plunkett (“For the glory of God”); Saint Columbanus (“We Irish are disciples of Peter and Paul”); Saint Columba (“Pilgrims for Christ’s sake”); and, Saint Brigid (“Naomh Bríd, a Mhuire na nGael guí orainn” tr. “Saint Brigid, Mary of the Gael, pray for us”).